This is the simple MDNode arbitrary tuple. Nodes are uniqued by default based on their operands. Definition at line 1105 of file Metadata.h. Definition at line 1160 of file Metadata.h. Definition at line 1158 of file Metadata.h. Definition at line 1132 of file Metadata.h. Referenced by llvm::GlobalObject::addTypeMetadata(), llvm::DIBuilder::finalize(), FunctionNumber(), llvm::MDNode::get(), getKeyValMD(), llvm::ProfileSummary::getMD(), llvm::DIBuilder::getOrCreateArray(), llvm::DIBuilder::getOrCreateMacroArray(), StripSymbolNames(), llvm::DISubprogram::toSPFlags(), llvm::upgradeInstructionLoopAttachment(), and upgradeLoopArgument(). 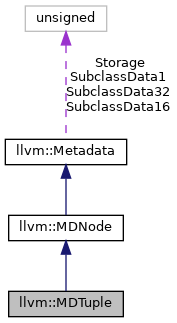 Return a distinct node – i.e., a node that is not uniqued. Definition at line 1143 of file Metadata.h. Referenced by FunctionNumber(), and llvm::MDNode::getDistinct(). Get the hash, if any. Definition at line 1130 of file Metadata.h. Definition at line 1136 of file Metadata.h. For use in constructing cyclic MDNode structures. A temporary MDNode is not uniqued, may be RAUW'd, and must be manually deleted with deleteTemporary. Definition at line 1152 of file Metadata.h. Referenced by CloneAliasScopeMetadata(), llvm::MDNode::getTemporary(), and LLVMTemporaryMDNode(). Definition at line 1106 of file Metadata.h. Definition at line 1107 of file Metadata.h.